Former Speaker of the U.S. House, Tip O’Neill famously observed that “All politics is local.” Now, with the announcement of Place Search on October 27, Google has given Search Engine Optimization a big kick in that direction. I’ve been involved with Search Engine Optimization and SEOs since 2005 when I cofounded the online forum SEOrefugee (I also managed the forum until its sale in 2008). While I haven’t offered stand-alone SEO services, I’ve incorporated SEO best practices into my web design and development services and have partnered with top SEOs on many projects. Lately a number of developments have rekindled my interest in SEO. A desire to expand their markets during difficult times. A former client who (without consulting me) invested in a totally new “search engine optimized” website only to have his traffic drop by 40% overall and search traffic by 56%! I was particularly intrigued by David Mihm’s Your Town SEO presentation, which featured tips for optimizing a web site for local search. I was so intrigued that I began experimenting with Local Optimization almost immediately. Though you wouldn’t think it was such a big deal from Google’s official announcement. What makes it a game changer is that Google is now automatically recognizing your location and using that information to customize your search results. While that’s been going on for a while in a limited way (the inclusion of a local map for some searches such as “dentist” or “doctor”), it has been greatly expanded in a couple ways. What will Place Search Mean? I don’t pretend to know all the implications of this change but some seem obvious. 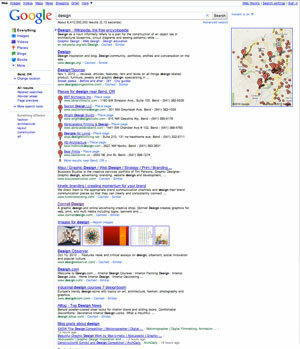 The search results you see might not be the same as the results someone in the next state (or even the next town) sees. Some local businesses stand to be big winners: The website of a friend of mine is now on the first page of Google for “design.” Prior to the change, that would have been impossible. Of course that’s only for people Google identifies as searching from Bend, OR but that’s who his potential clients are. The suburbs are screwed (at least for now): Google’s Places algorithm rewards proximity to the searcher (or the searcher’s Internet Service Provider). While that may be great for restaurant searches, it doesn’t work as well for other services (say designers) where people are traditionally willing to work with companies that may be more distant from them. Life for SEOs just got more interesting (and more difficult): The intrusion of local results into the organic results for even some generic search terms is going to push some companies with previously successful “global” SEO strategies off the front page of Google for their top keywords. So, does this mean the death of SEO as we know it? Probably not, but it certainly means the birth of a new SEO that will be defined in the months ahead. And, undoubtedly, Local SEO will be become the sole focus of Search Engine Optimization for many businesses and a major focus even for companies with a regional or national strategy. In the meantime here’s a list of blog posts from some top SEOs with their take on how Google Places is changing the SEO game. David Mihm: A New Kind of Local Search Result: The “O-Pack”?